In a previous posts, I counted the number of people killed by God in the Bible (2,301,427) and the number he plans to kill during the tribulation (3.25 billion). But, according to the Bible, he has even more killing in mind. 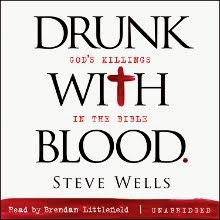 Where is God going to find so much blood? How many people would it take? Well, a furlong is 202 meters, so 1600 furlongs is about 320 kilometers, and a horse's bridle is 1.5 m high or so. If we take the winepress to be circular with a diameter of 320 kilometers, then the total volume is 1.2 x 1014 liters. And since an adult has about 5 liters of blood, that gives us 2.4 x 1013 people. Which could be a problem, even for God. Where will he find so many people? He's already killed off half of us in Revelation 8:6 and 9:15-18, so (assuming this all happens soon) that only leaves him with a little over 3 billion people to kill. His winepress requires nearly 10,000 times as many. Shucks! But then, I guess God is God and he can create more people just to kill them. So I suppose that's what he'll do. According to the dictionary, a lesser use of blood is juice especially when red. Now do the math. Anonymous said, "According to the dictionary, a lesser use of blood is juice especially when red." So the blood in Revelation 14:18-20 is really just grape juice? Thanks, Anonymous, for clearing that up. "So the blood in Revelation 14:18-20 is really just grape juice? Thanks, Anonymous, for clearing that up." I question your reference of death to God. Every human being that has everlived (with exceptions if you believe in a particular creed) has died. Is God responsible for those deaths? Which deaths is he actually responsible for? If you are assuming that every death during revelation is God's wrath, why not assume that everyone who dies is killed by God? I'd say that it's just blood without the necessity to kill somebody for it. Makes no sense, but at least you don't have to kill more people then exist. I like your blog and I like your religious skepticism site. I think however you are confusing religion and God/dess. In the Bhagavad Gita, which you haven't covered on your site, one of the last verses is "Abandon all varieties of religion and just surrender unto Me... do not fear." The ways to do this are given very gently and intelligently, without any threats of hellfire. And as to whether there is a God or not, the BG talks a lot about this in an intelligent way as well. However I'll make one important point. In nature everything has an originator, creator, or parent. Everything has some origin. I don't care if you believe in evolution or creationism or whatever, there is still an origin of the genetic material. Many intelligent people who don't believe in God, would laugh at the idea that the Mona Lisa painted itself spontaneously. Yet how much more completely ludicrous, is the notion that the gazillions of vast universes, stars, planets, billions of species, and so much more... all just "painted" itself with no mind behind it? Many cite suffering and evil as reasons to disbelieve God. This is a no brainer, actually... we were given minute free will, and decided to choose an ego-centric, self-serving existence (this is described in the Bible as the fall of man, and is pretty universal in most religious teachings). This is why there is evil. The Bhagavad Gita's of God is not dualistic (bad/good, heaven/hell), it is not a punishment/reward system, nor is it absolutist. The BG talks about God's qualities and vastness and the various ways you can approach God... not how you will get your fingers chopped off or you'll get burned in a fire if you don't blindly obey. I respect all religions but I do not respect how people have interpreted them. And I do not like how many of these scriptures have misinterpreted the Vedas which are way older than the Bible... and infinitely more comprehensive. Most religions are a small fragment of this vast ocean of knowledge, some of which is relevant today and some which is not... JUST like the Bible/Quran/Book of Mormon etc. Ugh. I wish the book of Revelation had not made it in to the bible. It was debated whether it should be included or not. The flipside, is that it makes for a great work of fiction. (Seriously, its just some dude's visions. I heard someone once say that its a acid induced vision, lol.) Plus, you get great visions of the evil of Satan. Oohh eerie doom. Were the Book of Revelation to be written today, I'm pretty sure its author would be committed to an asylum. So, we could use the compound interest formula to estimate when the human population would reach this absurd values, and thus estimate when the second comming of Christ would be! Wikipedia says that the populational growth is actually 1,19% per year, so lets assume it will be 1%, just for the sake of the argument. So, if my math is right, christians will have to wait another thousand years or so for the second comming of Christ! Haha, someone warn www.raptureready.com/ that they are wastin their time! If you're right that it's about 900 years (maybe a little less since you rounded down for the rate), then it should be spread everywhere around the Christian blogosphere that the second coming won't be anytime soon. That way, Sarah Palin types won't try to get us all destroyed long before then. Fundamentalists, literalists, etc. use all sorts of calculations from the Bible to determine the age of the Earth, why Noah's Ark supposedly is feasible, etc. Certainly they would take a calculation from Revelation seriously! Then, after the imminent end times warnings all calm down after this "proof" from the Bible itself, we'd have about 900 years for Christians (and hopefully all religions) to finally realize that God is made up. Consarned math! - it's enough to trip up a deity every time. Including the deity that, uh, invented it. "But then, I guess God is God and he can create more people just to kill them. " Yes, don't forget about the respawning Amalekites. They always seem to be around when great slaughter is needed. Just 13 verses before this one salvation was offered to every inhabitant of the earth in their own language. Let's say your drowning and the only boat in the whole world pulls up and someone says to you plainly, "take this life vest and I'll pull you up and take you home to the only land left to live in my mansion as my cherished one with all the millions of other people I've rescued and you'll live in joy and peace forever" and then you said "you can't tell me what to do!! And drowned. Now you die at the bottom of a cold dark ocean and it's the guy on the boats fault.